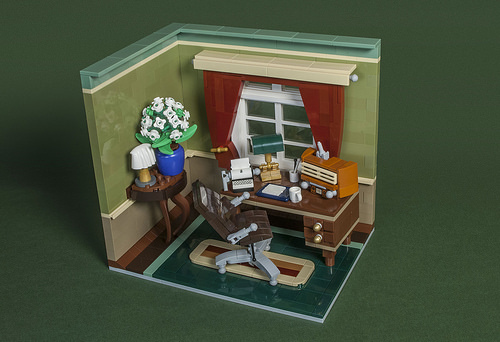 In an office as fancy as this one by Sven Franic, paperwork is no longer a chore, but a joy. Warm earth tones, elegant ornaments, and a comfortable chair make for a great atmosphere. Anyone spending most of their day writing would be envious of such an office. The centerpiece of the build is literally a piece – the light gray minifig microphone piece, used in ingenius ways throughout the build. Do not think that is all, as there are unique uses for exotic parts everywhere. The radio and typewriter obviously stand out, but I strongly suggest looking at all segments of the scene more closely, because even such background features as the wooden window frame turn out to be tiny little masterpieces of their own.